ABOUT PRODUCTThis would look pretty as a backdrop for a garden wedding, as a photo prop, or for that special little girls room. 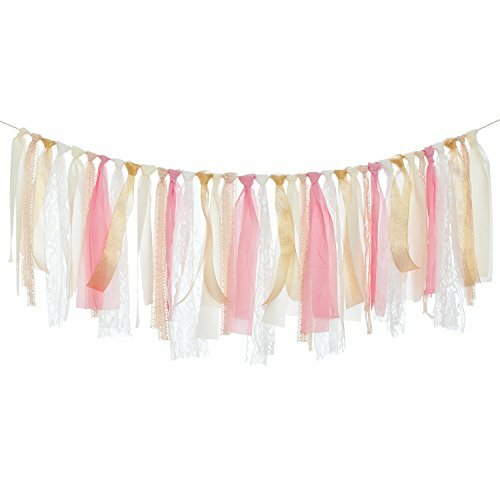 Our Shabby Banners are perfect for a photo shoot, birthday party, baby shower, wedding shower, wedding decor or in your nursery.There are so many possibilities for this beautiful garland.ABOUT USLing's moment Ltd. Co. is a wedding supplies and decoration provider. Based in Houston, Texas, we also have a sourcing office in Shenzhen, China.We insists on the best quality and price for every single product, meanwhile we promised our best service for every single customer.If you have any questionor suggestion, please do not hesitate to contact us by mail. 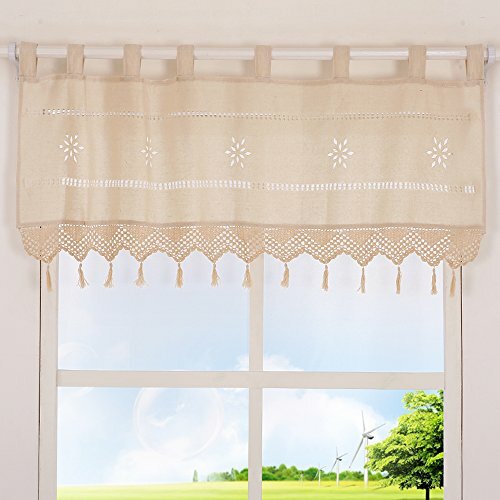 Specifications:Size: H 17 inch x W 59 inch (about 45 x 150 cm), Sold as one piece.Note:The valances is Cream / Light beige, Not white (it may be a little bit different due to Display on different computer monitors).Features:It is made from 70% cotton and 30% linen, cotton beauty, semi-shade 40%-70% cream valances.Handcrafted kitchen curtain valance has a beautiful crochet lace and mini tassels design spread across the bottom.Charming hollow floral prints and the patchwork tab top are the most stylish retro styling.Very good service for your bedroom, dining room, kitchen, living room, A Better Choice. Each window is a poem also is a picture Life-love people will make it a variety of scenery Snuggle on the window has become a beauty scenery So that the spring could not help but want to park in the window The window is the drawing of the house Is the pen of the poem Waiting for us to make it perfect Pastorale Countryside style: It presents the expression has been perfect interpretation of the aesthetic poeticretro temperament, in this hustle and bustle of the times seem so calm and elegant,it is independent of the popular trend can always move at any time , to move the heart of the people, The pursuit of classic style of people. 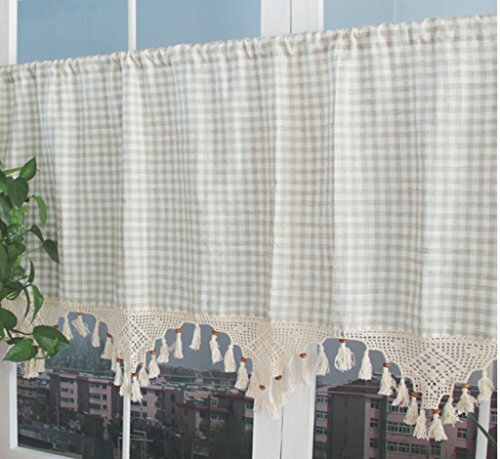 Pastorale Countryside style hollow, Linen fresh and cool Pastoral curtain with lace rose flower pull design, hang on your window ,kitchen,cafe ,balcony ,it is so beautiful. 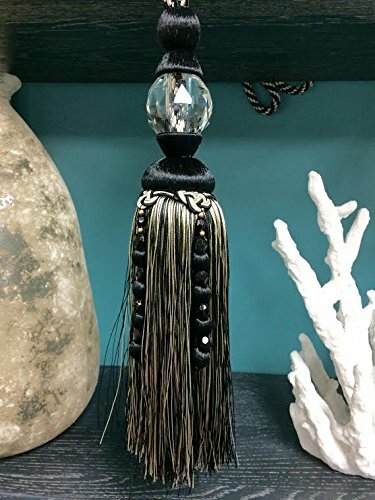 These colorful beautiful ribbon tassels will add a festive touch to all your outdoor or indoor gatherings. Be it weddings, graduation parties or simply adding décor to your home this garland adds just the right amount of accent to any open space. This would look pretty as a backdrop for a garden wedding, as a photo prop, or for that special little girls room. There are so many possibilities for this beautiful garland. 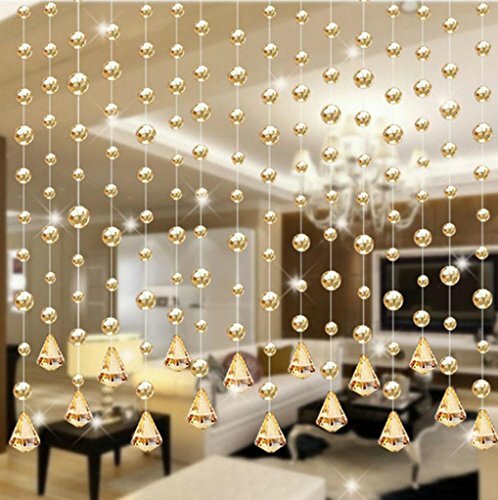 It instantly glams up any occasion or space. Your garland will be very similar to the picture but actual lace may differ in pattern depending on stock. 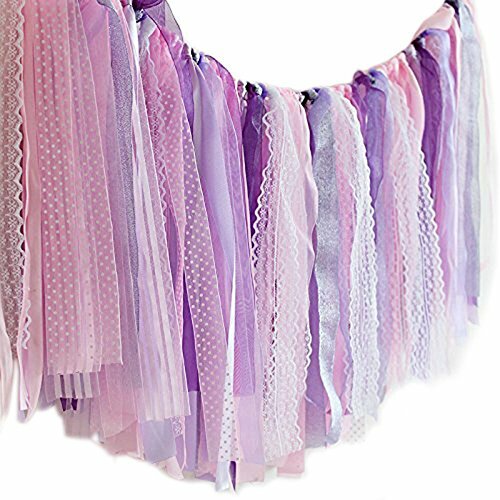 Material: Premium Quality tassel garland, made from carefully selected ribbon, can be reused. The beautiful, high quality must be noticed by your loves. Strings on both ends for easy hanging, you can directly hanging the bunting banner in any place you like, just like on the ceiling, window frame, branches. They're also fabulous to use as a photography backdrop. Amazing party stuff, Can be used at baby's 1st birthday, baby shower, party decorations, wedding and more. 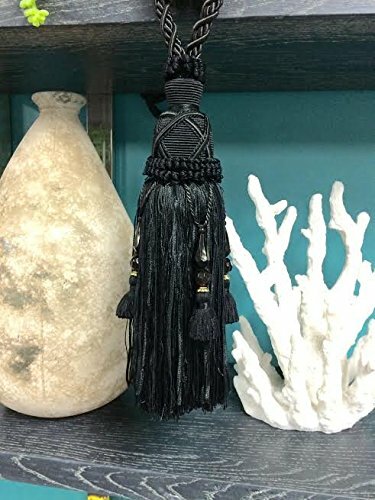 Specifications: Material: Polyester Color: Black Shape: Rectangular Size: 38''X40''(96.5*102cm) Features: - Display on mantle, over interior doorway, hutch, buffet or as a backdrop. - Fun spooky Halloween decoration and party accessory for year round use. - Holes along top border for lacing with your own ribbon or elastic to gather or pleat. Package included: 1 X Halloween Party Curtain Note: Please allow slight 1-3cm difference due to manual measurement and a little color variation for different display setting. Thank you for your understanding! 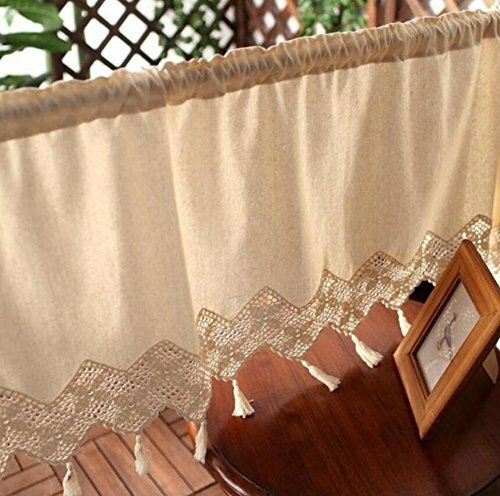 Specifications:Size: H 17 inch x W 70 inch (about 45 x 180 cm)Sold as one piece.Features:It is made from Cotton Linen, durable & user friendly valances window treatment.Retro style valance with burlap and lace, beige and white cross.Features cotton knitted net with crochet trims, elegant tailored valance embellished with wooden beaded mini tassels.Engineered scallop edge, the valance is perfect for 1 inch or 1.5 inches Rod Pocket. . 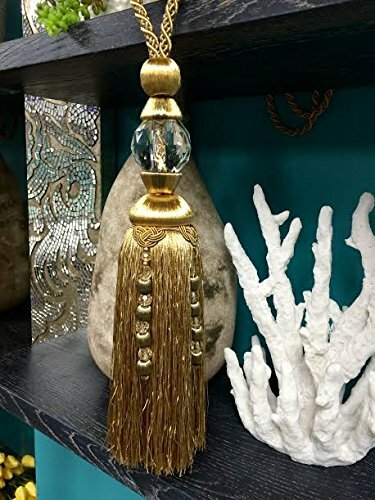 This a Beautiful 12" High Quality Single Curtain Tie Back.. 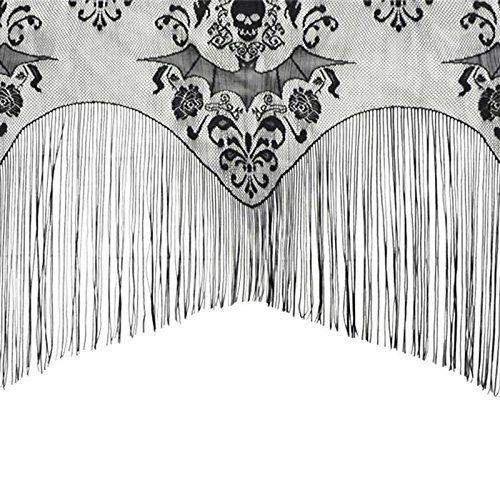 Compare prices on Tassel Valance Lace at ShopPlanetUp.com – use promo codes and coupons for best offers and deals. We work hard to get you amazing deals and collect all available offers online and represent it in one place for the customers. Now our visitors can leverage benefits of big brands and heavy discounts available for that day and for famous brands.